Ridgway, Morley, Wear & Co. (1836-1842) 7.5 inch plate printed in brown and painted in green in the "Caledonian" pattern. April 6 is National Tartan Day in the United States (the date was established by Congress in 1997 to recognize Americans of Scottish descent). 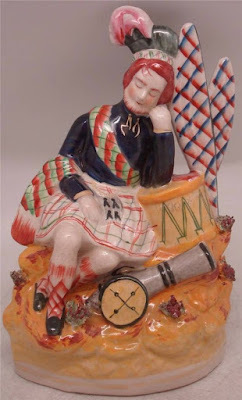 I wondered why it wasn't called National Plaid Day, as tartan and plaid are used interchangeably in the United States. My friend, Arlene, who is from Scotland, told me that a plaid is a tartan pattern (a tartan pattern consists of crossed horizontal and vertical bands in two or more colors in woven cloth) slung over the shoulder as a kilt accessory. In Scotland, only the word tartan is used for everything else. I have learned something new. 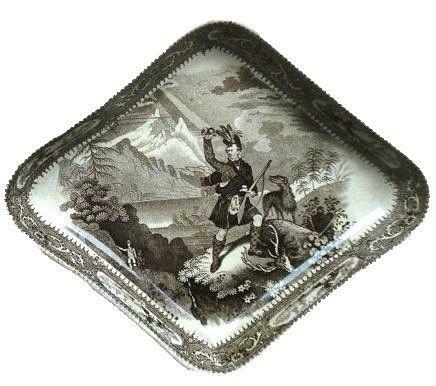 There are many transferware patterns that feature Scottish subjects and tartan and plaid. 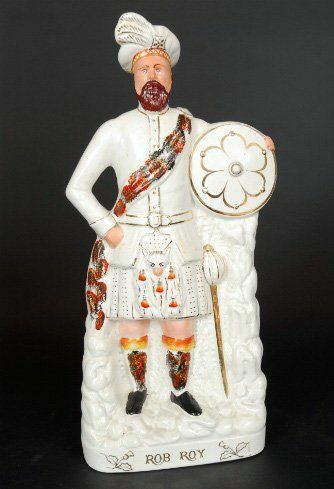 For example, the "Caledonian" pattern. (Caledonia is the name the Romans gave to northern Scotland). 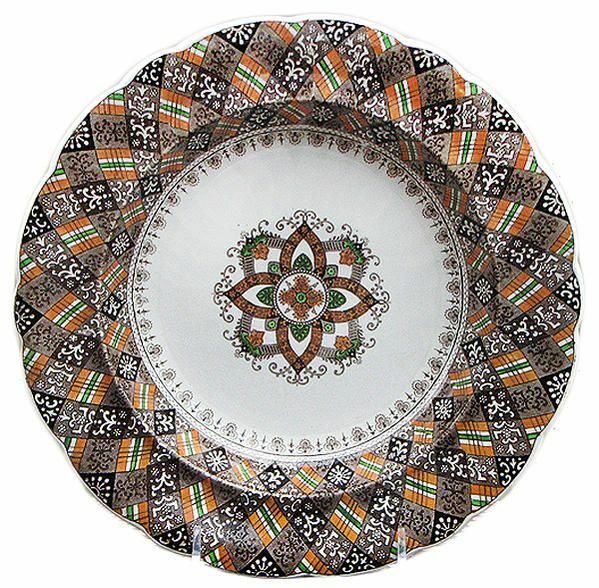 The Transferware Collectors Club Pattern And Source Print Database says: "The added painted colors of the "Calendonian" pattern are painstakingly executed in each example as if to replicate the color and line of woven Scottish tartans. But it is perhaps the soup plate with its denser coloring that best relates this pattern to the colorful and distinctive family tartans worn by the Scottish clans in the Highlands of Caledonia." I think the teapot and the plate above show wonderful tartan colors too. The Scotland Highlands, along with men wearing kilts, tartan and plaid, feature in a series titled "Caledonia." It was made by both William Adams IV & Sons (1829-1861) and the Middlesbro' Pottery Co. (1834-1887). 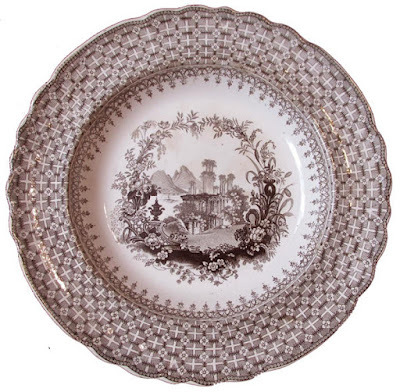 William Adams IV & Sons (1829-1861) 10.5 inch plate in the "Caledonia" pattern. Do you see the plaid? 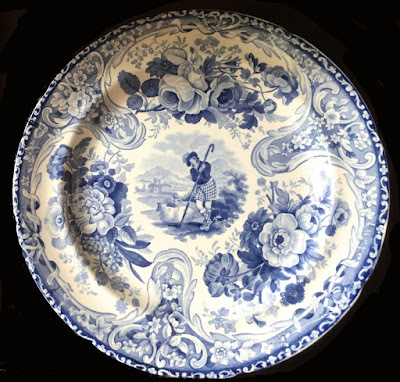 Middlesbro' Pottery (1834-1887) "Caledonia" pattern. The patterns above show that Adams and Middlesbro' used some of the same patterns, but remember that "Caledonia" is a series, so many different patterns were made (The TCC shows 15 Caledonia patterns in its database). However, I digress. Back to tartan and plaid. Below is an Adams jug with a clearer look at a plaid. Remember, it is the fabric wrapped around the hunter's shoulder and waist. "Plaid" is Gaelic for blanket. Was it used to keep a person warm? 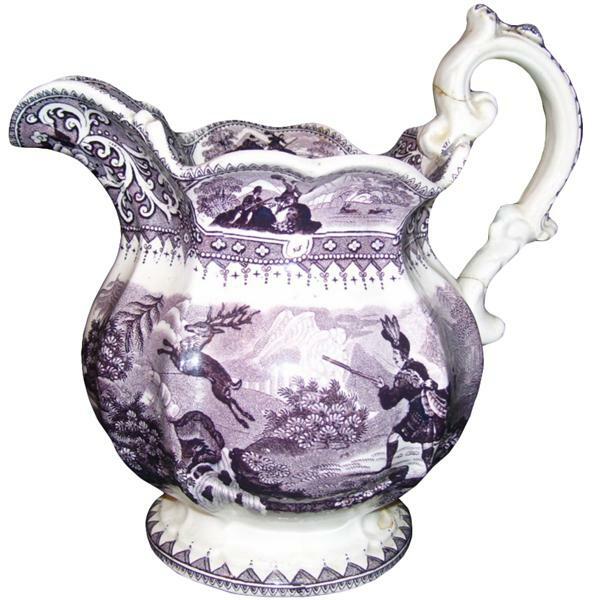 Adams jug in the "Caledonia" pattern. Notice the plaid on the hunter. You can make the photo larger by clicking on it. 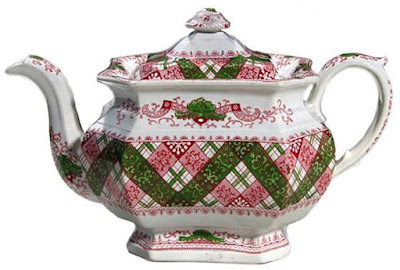 Enoch Wood & Sons (1818-1846) made a pattern titled "Plaid." Just when I thought I understood the difference between plaid and tartan, I discovered this pattern. 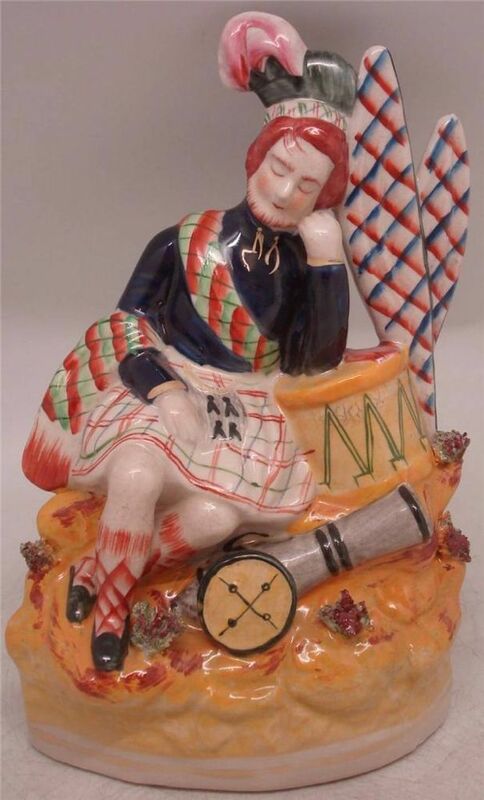 It should have been called "Tartan." Perhaps it was intended for the American Market. 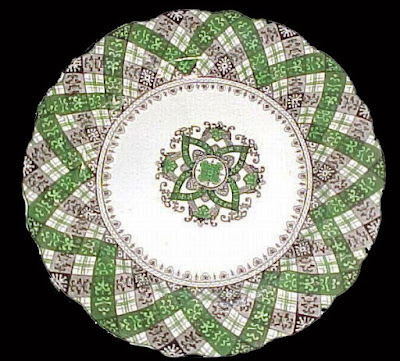 Enoch Wood & Sons 10.5 inch plate in the "Plaid" pattern. 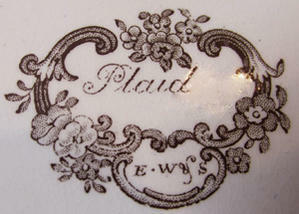 Notice that unlike most transferware patterns, the title describes the border rather than the center. Here is a pattern to test what you have learned. Is there a plaid in this pattern? 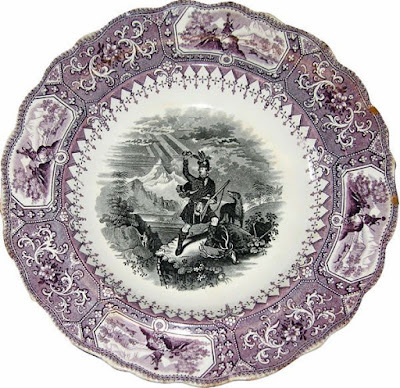 John Benton Bagster (1823-1827) 9.75 inch plate from the "Vignette" series. 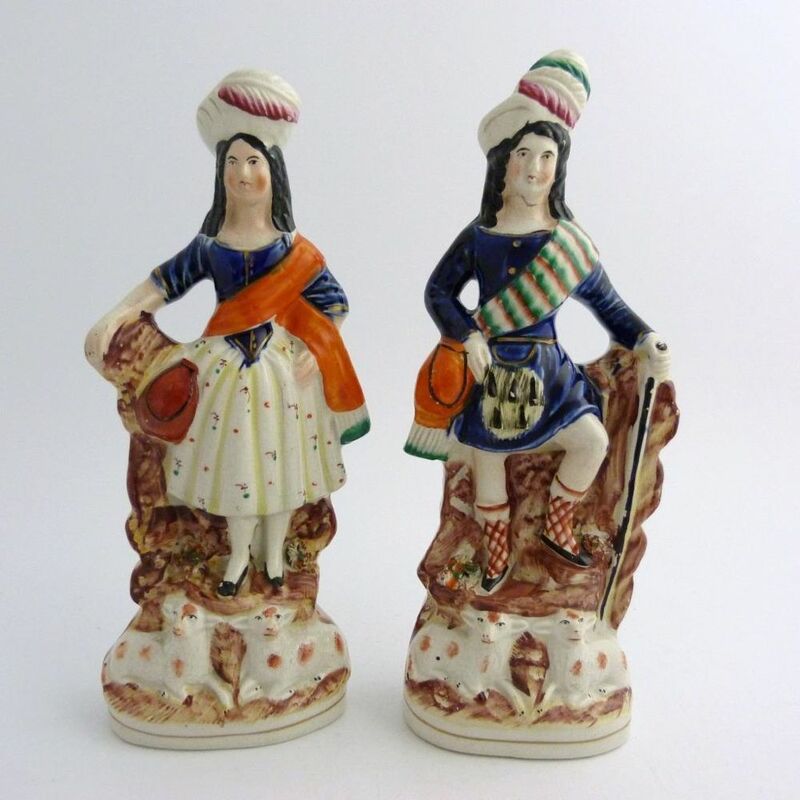 Just for fun, I'll show you tartan and plaid on Staffordshire figures. Who is wearing a plaid? Rob Roy is definitely wearing a plaid! Thanks, again, I learned something new! Dish patterns are an education!